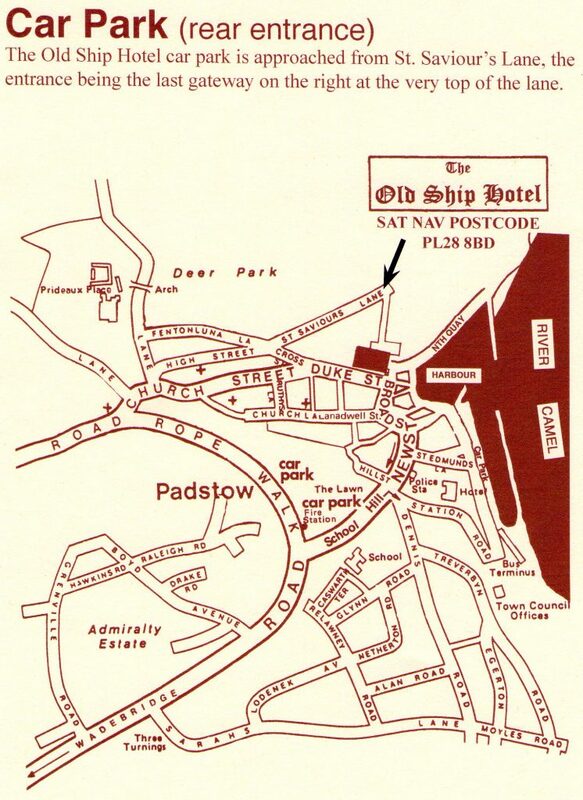 Map to car park and Cancellation policy. Notice of cancellation greater than one month of date of arrival – Full Deposit returned less £10 administration fee. Please note that when staying over periods with a stipulated minimum nights stay (e.g. May day, Festive Festival or Royal Cornwall Show), the full amount will be payable on departure including if checking out before the booking end date. Car Parking is included in the tariff of your accommodation. There is adequate parking in our car park and we suggest that the lower tarmacked area is used first, then proceed to fill the right handed side by stone wall without parking in any reserved spaces. Assistance with suitcases and bags is always offered. On your arrival to the car park please call 01841 532357 and we will be more than happy to assist you. Please note : Due to the Smoke-free Legislation The Health Act 2006, All of our hotel rooms are Non-smoking. Any persons found doing so will be charged accordingly. If a group booking is made, then it is the organizers responsibility to ensure the other members are notified of this policy. If no members are aware of the policy, the organizer will be held responsible.